"The Garmin Speak Plus is an easy way to bring Amazon Alexa's popular functionality to your car," said Dan Bartel, Garmin vice president of global consumer sales. "Just as Amazon continues to enhance Alexa's voice service with exciting new skills, Garmin creatively merges its world-renowned GPS navigation and camera technology with the Speak Plus. The added dash cam is discreet yet provides invaluable peace of mind to drivers who want an extra set of eyes with them in case an incident occurs." "Alexa is always getting smarter and we're excited to see Garmin continue to innovate on the in-car Alexa experience," said Ned Curic, Amazon Alexa vice president of automotive. "Customers want to be able to access Alexa wherever they are, and that includes the car. Alexa will help customers do thousands of things in the car including navigation, music, shopping lists, accessing their favorite skills, and more." 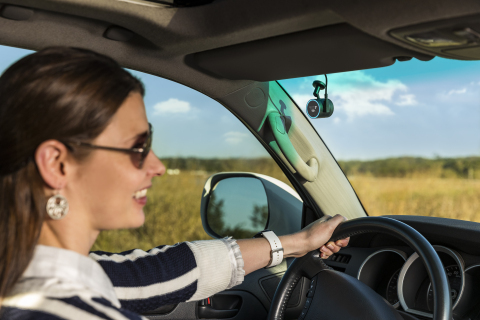 The new dash cam gives Garmin Speak Plus users increased awareness on the road. It offers helpful alerts like Forward Collision Warnings that lets drivers know if they're too close to the vehicle ahead; Lane Departure Warnings if the driver drifts off the road or into oncoming traffic; and "Go Alerts" to notify drivers when stopped traffic ahead begins to move. At just an inch and a half in size, the compact Garmin Speak Plus features a familiar LED light ring - reminiscent of the Amazon Echo - and a bright OLED display showing lane guidance arrows to guide drivers to their destination, and unobtrusively secures to a vehicle's windshield with a magnetic mount for easy stow and go. Like its predecessor, drivers can ask Alexa to play songs from several free- and subscription-based music services, including Amazon music, Pandora ® and Sirius XM ®. With the purchase of a Garmin Speak or Garmin Speak Plus device, new subscribers can enjoy a two-month subscription to the Amazon Music Unlimited Family Plan. 4 Popular services, such as Spotify ®, are expected to be included as additional streaming services become available. In addition, drivers can activate Garmin turn-by-turn directions to shops, restaurants, and more with the simple phrase, "Alexa, ask Garmin…". Garmin Speak Plus turns words into action so drivers can keep their hands on the wheel and still accomplish tasks like creating shopping and to-do lists, monitor traffic updates and weather, and control smart home devices 5 while traveling on the road. Garmin Speak Plus works in conjunction with the Garmin Speak app and a Bluetooth ®-enabled smartphone with a suitable cellular data connection. Drivers can then use Bluetooth ® or an AUX cable (not included) to hear audio through their vehicle's speakers - accept or ignore incoming calls, hear a favorite tune, and more. The vehicle-dedicated device does not rely on a Wi-Fi ® hotspot to function. Amazon Alexa lives in the cloud and will continue getting smarter as it automatically delivers new capabilities to the Garmin Speak Plus. The more customers use Alexa, the more Alexa adapts to speech patterns, vocabulary, and preferences with new features continually being added. Alexa skills promote new capabilities that allow Garmin Speak Plus users to develop a more personalized experience with Alexa. What's more, automatic software and mapping updates are regularly sent to the Garmin Speak Plus to keep the device up-to-date. With a suggested retail price of $229.99, Garmin Speak Plus will be available to customers starting mid-February through Garmin, Best Buy, Amazon and other retailers. A special limited time pre-order price of $199.99 will be available from Jan. 8 to Feb. 10. For more information, visit garmin.com/speak. Garmin Speak Plus with Amazon Alexa is the latest from the consumer automotive segment of Garmin, the leading worldwide provider of portable navigation devices for automobiles, motorcycles and trucks. The company's user-friendly navigation solutions have innovative features that provide time- and fuel-saving benefits to meet the demands of everyday driving. For decades, Garmin has pioneered new GPS navigation, advancements with camera solutions, wireless devices and applications that are designed for people who live an active lifestyle. Garmin serves five primary business units, including automotive, aviation, fitness, marine, and outdoor recreation. For more information, visit Garmin's virtual pressroom at garmin.com/newsroom, contact the Media Relations department at 913-397-8200, or follow us at facebook.com/garmin, twitter.com/garmin, or youtube.com/garmin. 1Drivers should focus on driving and only use the device when safe to do so. 2Some jurisdictions regulate or prohibit the use of a dash cam device. It is your responsibility to know and comply with applicable laws and rights to privacy in jurisdictions where you plan to use this device. 3Certain conditions may impair the warning function. Visit Garmin.com/warnings for details. 5To control smart home devices you must have or create an Alexa smart home skill that works with your smart home products. Garmin International Inc. is a subsidiary of Garmin Ltd. (Nasdaq: GRMN). Garmin Ltd. is incorporated in Switzerland, and its principal subsidiaries are located in the United States, Taiwan and the United Kingdom. Garmin is a registered trademark and Garmin Speak and the Garmin Speak app are trademarks of Garmin Ltd. or its subsidiaries. Amazon, Alexa, and all related logos and motion marks are trademarks of Amazon.com, Inc. or its affiliates. The Pandora logos are trademarks of Pandora Media, Inc. Pandora is only available in certain countries. Please visit http://www.pandora.com/legal. The Bluetooth® word mark and logos are registered trademarks owned by the Bluetooth SIG, Inc. and any use of such marks by Garmin is under license. All rights reserved. This release includes forward-looking statements regarding Garmin Ltd. and its business. Such statements are based on management's current expectations. The forward-looking events and circumstances discussed in this release may not occur and actual results could differ materially as a result of known and unknown risk factors and uncertainties affecting Garmin, including, but not limited to, the risk factors listed in the Annual Report on Form 10-K for the year ended December 31, 2016, filed by Garmin with the Securities and Exchange Commission (Commission file number 0-31983). A copy of such Form 10-K is available at http://www.garmin.com/aboutGarmin/invRelations/finReports.html. No forward-looking statement can be guaranteed. Forward-looking statements speak only as of the date on which they are made and Garmin undertakes no obligation to publicly update or revise any forward-looking statement, whether as a result of new information, future events, or otherwise.